Desi's in the Arab Land: Fashion Wednesday: We are Back!! Fashion Wednesday: We are Back!! A fresh start of the blog, hopefully with more dedication, more information and with wide range of topics to be discussed!!! Like today i share a new interest i have acquired over the past few years i.e. Nail Art.... Its history dates back to 3000 BC and it has been popular in the Chinese, Egyptian and Indian history. At one point the nail color would show the status one has socially. In the 19th century it started to get mainstreamed and a brand called "Revlon" was among the pioneers to shape up this industry!! Now you see all kinds of amazing nail tutorials on YouTube teaching you how to apply a basic nail color to making all kind of different themed nails. Keeping in mind about our fresh start of the blog and the season we are in i.e. Spring, I thought i share my simple springy nails. Product used: Grey color from Golden Rose and hot pink color from Bourjois (no. 15) & Black color (black queen) from Sweet Touch. 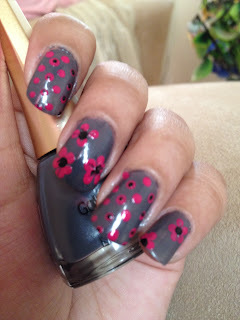 You are more than welcome to join and try doing a simple spring nails and share with us!! Pregnant Saturdays: Pregnant and Alone?? ?